Inspired here I built my first workbench. I already had a machine laminated spruce slab with pretty raw uneven surface (1m x 2,4m), that served me for years as workbench on wobbly saw horses or scaffold stage. It was intended to be used as a framework slab for my concrete pillar creations, that luckily not happened. I was looking for collapsible but stable base to replace sawhorses. posts – beefy 8×16 cm dimensioned “offcuts” from lumber yard. side rails – excess larch fence lumber from my brother. front rail – larch joist from my balcony with laminated ends. stain – Osmo wax and mahogany stain oil. glue – warter based D3 grade glue. I used my plunge saw instead of tablesaw joinery. My combined tablesaw / mitre saw is not capable of angled cuts. D3 grade glue was used for end assemblies. I ran out of nice spruce lumber, so I used pallet wood for wedges. Once hammered together the base is rock solid. I’m Wondering if there is some scale of “solidness”. Many workbenches are so wobbly, this one can be strengthened by just 4 good aimed plastic hammer hits. Nice bench. If you are interested in some wedge based vices to go with it check these out. I am sure your bench is rock solid. I’m a big believer in the power of wedges. It looks like you did a fine job on this bench and it will make a nice addition to you shop. Nice looking bench, good work! Echo: i think you owe Rick a thank you for fixing your neck straining pics! welcome to lumber jocks just learn how to post em straight. thanks for letting me know ;-) Well, 9 out of 10 photo viewers and web pages read the exif info of the picture file and rotate it automatically. I will keep in mind to do it manually for lumberjocks in future. those vises are awesome! 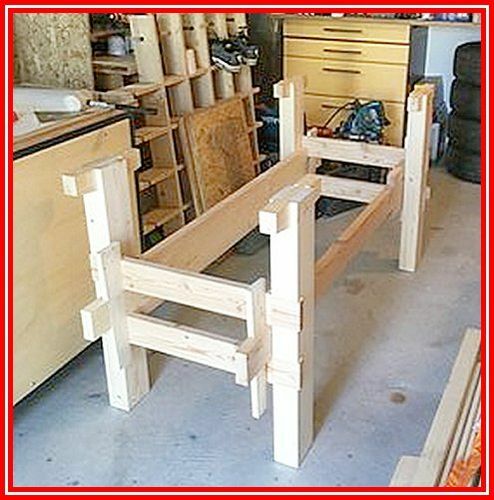 I will use the wagon vise for sure – it keeps the slab “low profile” and no crank or winch sticking up. GREAT IDEA! Not sure about the leg vise. In my case the leg is recessed under the slab. I will use under bench vise on the left side – I am just used to it.